The end of summer doesn’t have to mean the end of fun at the beach! August through October can be the most beautiful and uncrowded times on Northwest Florida’s Gulf Coast, and Mexico Beach’s fall 2012 event schedule is bursting with fun for families, athletes, artists and locals alike! 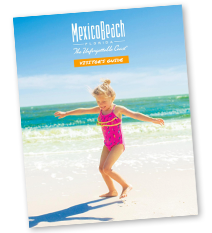 With smaller crowds and several great fall events on the calendar, there has never been a better time to enjoy the sand, surf and sunsets on the sugar-white sands of Mexico Beach. It is many locals’ favorite time of year! Called “The Unforgettable Coast”™, this nostalgic little fishing town is the epitome of a simpler way of living, without high-rise condos or big commercial restaurants. It’s the place to experience Florida’s Gulf Coast as it once was and to make memories that will last a lifetime. Plan your escape to Mexico Beach this fall to experience it just as the locals do. The Unforgettable Coast is a world away, yet just a short drive from Pensacola, Tallahassee, Fort Walton Beach and Panama City—perfect for a weekend getaway. Join us for the end of scallop season in St. Joseph Bay from now until September 10. Scalloping is easy and fun for the whole family. Mexico Beach has all the equipment you’ll need to fill your bucket with these delicious little morsels. Bring your chairs and coolers to Sunset Park every Thursday in September and enjoy great sounds from talented musicians as Music in the Park kicks off again! Sunset Park is located next to the El Governor Motel; concerts begin at 6:00 p.m. Visit Mexico Beach’s website for the complete band lineup listed in the Calendar of Events (Mexico-Beach.com). Athletes from all over the world travel to Veterans Memorial Park in St. Joe Beach to run, bike, and swim in this USA Triathlon sanctioned event along the beautiful white-sand beaches and pine forests of the Gulf Coast. The fall race will be held September 8, 2012. A celebration will follow the race with great food and fun at Veterans Memorial Park. For registration and more information, visit BeachBlastTriathlon.com. The 14th Annual Mexico Beach Art & Wine Festival will be held at the Driftwood Inn on Saturday, October 6 beginning at 2:00 p.m. Come help the Special Events for Mexico Beach Committee raise money for next year’s “Best Blast on the Beach” 4th of July Celebration as they feature fine wines, great food, live and silent auctions, musical entertainment and, of course, art! Artist awards, including Best in Show, will be announced around 6:00 p.m. Commemorative wine glasses and posters can be purchased during the festival or in advance at the Mexico Beach Welcome Center or at Driftwood Inn. Florida’s Unforgettable Coast will play host to a group of talented musicians and songwriters direct from the streets of Nashville during the Fourth Annual Blast on the Bay Songwriters’ Festival October 19–21, 2012. The event will include crowd favorites such as Lisa Shaffer, Steve Leslie, Walt Aldridge, and Charlie and Dana Hunt Black playing at venues like the Thirsty Goat, Mango Marley’s, Toucan’s, the Haughty Heron, Provisions, St. Joe Bar and, of course, Indian Pass Raw Bar. This annual event has continued to deliver on the promise of an incredible time for anyone who appreciates great music. All shows are either free of charge or request a minimal donation. Everyone who loves music is encouraged to come out and enjoy. Visit BlastontheBay.com for more information.